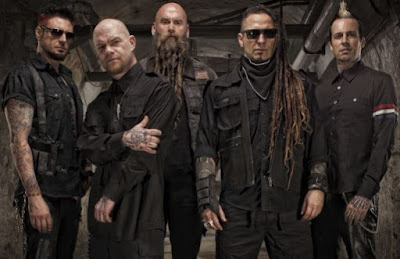 Five Finger Death Punch partnered with Pandora for a first listen of the new album, "Got Your Six", which will be released on September 4. Five Finger Death Punch guitarist Zoltan Bathory said: "I'm an avid Pandora user, so I was very exciting when Pandora approached us and we learned that five million fans to date have created Five Finger Death Punch stations on their platform, so working with them on debuting 'Got Your Six' seemed like a natural fit. We are looking forward to everyone hearing the new album and this premiere allows all those fans to access the new music for one week and pre-order the album." Added Lars Murray, SVP Music Makers Group, Pandora: "Rock radio is alive and kicking on Pandora and Five Finger Death Punch is evidence of that. They have a large and active audience on the platform with nearly five million station creates and over 750 million spins to date, so we're proud to be home of the 'Got Your Six' premiere."